Morgellons: Emerging New Disease Or Self-Delusional Hype? The Mayo Clinic calls Morgellons Disease “…a mysterious skin disorder characterized by disfiguring sores and crawling sensations on and under the skin. The CDC is more circumspect, referring to the condition as Unexplained Dermopathy (also known as “Morgellons”). As such, the agency has opened up a clinical investigation on the matter. Persons who suffer from this unexplained skin condition report a range of cutaneous (skin) symptoms including crawling, biting, and stinging sensations; granules, threads, fibers, or black speck-like materials on or beneath the skin; and/or skin lesions (e.g. rashes or sores). In addition to skin manifestations, some sufferers also report fatigue, mental confusion, short term memory loss, joint pain, and changes in vision. The condition was first reported in 2001 by Mary Leitao—trained in biology—on behalf of her two-year-old son, who had developed skin lesions, and complained of “bugs.” She examined the lesions and discovered colored fibers in them. She claimed that the fibers were actually emerging from the sores. However, the boy was examined by many physicians, who did not find any known disease in the child. Moreover, a number of doctors familiar with the case felt that Leitao might suffer from Munchausen’s syndrome by proxy, and suggested that she should seek psychiatric care. That this description bears little resemblance to her child’s symptoms (Morgellons patients speak of tiny fibers and not harsh hairs) should immediately give one pause. Indeed, in Browne’s description, Morgellons is therapeutic, delivering the child from coughs and convulsions. 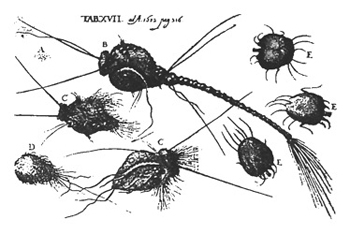 A detailed analysis, entitled “Sir Thomas Browne And The Disease Called The Morgellons” appeared in 1935 in the journal Annals of Medical History. The author—C.E. Kellett, M.D., M.R.C.P.—described the condition as a pediatric worm infestation. Numerous websites now cover this condition, ranging from true believers to skeptics. Usually, the believers are either the patients themselves or their spouses, and the skeptics are those who are trying to apply some sort of scientific tests to all the many claims and symptoms set forth. Suffice to say that the overwhelming consensus of health care professionals is that Morgellons does not in fact exist, and is simply a new name for a variety of conditions—including delusional parasitosis—that have been conflated into this so-called new disease. In delusional parasitosis, also known as delusions of parasitosis (DP), the patient believes that his itching is due to an infestation with insects. Patients may present with clothing lint, pieces of skin, or other debris contained in plastic wrap, on adhesive tape, or in matchboxes. They typically state that these contain the parasites; however, these collections have no insects or parasites. DP is considered primarily a monosymptomatic hypochondriacal psychosis and has been associated with schizophrenia, obsessional states, bipolar disorder, depression, and anxiety disorders. DP occurs primarily in white middle-aged or older women, although it has been reported in all age groups and in men. In classical DP, the skin lesions are self-induced, and the patient is extremely reluctant to be referred to a psychiatrist. Related to this is the condition called neurotic excoriations (NE), caused by repetitive scratching. The excoriations can be initiated by some actual pathology, such as an insect bite, folliculitis, or acne, but it can also be independent of any pathology. Given the absence of any significant organic process in the skin, this is considered to be a psychologic process with dermatological manifestations. Notably, many NE patients remove imaginary foreign bodies from the lesions. Given that a large percentage of Morgellons patients are middle-aged and older women, it is significant that a goodly number of the symptoms mentioned can occur in menopause. Thus, Morgellons sufferers may well have some sort of legitimate condition. Perhaps they are unhappy with the treatment they are receiving, and continue to scratch the lesions in frustration. Certainly, skin conditions can be very annoying, and are typically not easily cured. In many cases they will recur throughout a patient’s life. The frustrated patient will search the Web, and find sympathetic fellow sufferers, who say they have Morgellons. There is great satisfaction in discovering a diagnosis, especially after many doctors tell you that it is “all in your head.” At that point, it matters little that the disease is not recognized by most authorities. On the contrary, it may reinforce their feelings that establishment medicine cannot cure them. Sadly, there is a growing list of Morgellons specialists who are only too willing to cater to these poor patients. Will the CDC investigation put an end to these abuses? Time will tell.